Basement remodeling is a fantastic way to add beautiful, usable space to your house or home. Unfortunately, it's not always an option if your basement is leaky, damp, or flooding. Before you can embark on a basement remodeling project, you'll need to take care of your leaky basement. Water leakage and seepage in your basement detracts from the value of your home in a variety of ways. Not only does water pooling mean that you can no longer use your basement for storage, it can also mean water damage which in turn means expensive repairs. Before basement remodeling, you'll need to take care of the musty, moldy air quality caused by a leaky basement, as well as repair any flaws in your basement's sealant that are allowing the water to penetrate your home. Waterproofing your basement does not have to be difficult, our waterproofing contractors are just what you need to turn your basement back into a lively, warm, dry and beautiful space that can be used not just as storage but as a great living space or common area for your home. Water damage can have serious effects on your home, so don't wait to get it fixed. We're glad to answer any questions that you might have, give us a call today so you can get started on your basement remodeling! We have basement remodeling contractors standing by. How did water get in there? When houses are built, it's understood that their basements will be exposed to plenty of underground moisture and dampness, and preventative measures are used to stop water from getting into your basement. Normally those preventative measures are in the form of tar or other sealant used on the exterior of your basement walls, and sometimes this sealant woks fine for the duration of your home's life. Unfortunately, either through a construction error or unforeseeable weather circumstances, the sealant of your basement sometimes breaks down over time and begins to allow water into your house. 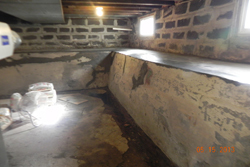 There are plenty of circumstances that could contribute to your leaky basement. If you have plenty of covering trees or shrubs in your yard, it's likely that the soil doesn't get enough exposure to the sun to be thoroughly dried out after morning dew and rain or other precipitation. If your yard retains more moisture than normal, the pressure on your basement's sealant barrier is increased which shortens its lifespan. Also, a steep or graded yard can contribute. If, during rain, your yard is sloped in such a way as to cause water to drain in the direction of your home, the pressure on your home's moisture barrier can be increased. Regardless of what's causing your basement to leak, we're dedicated to providing you with a dry basement that lasts so that you can move on to basement remodeling. Speak with a basement remodeler now! How bad is water damage? Water damage can be very, very serious, and you certainly can't embark on basement remodeling while you have leaking walls or a leaking foundation. Beyond just making your basement unusable and damaging anything that you have stored there, a leak in your basement can adversely affect the structural soundness of your home and even have ill effects on your health. When water leaks into your home it evaporates into the air, increasing the humidity drastically and increasing the amount of moisture absorbed by your walls, structural supports, ceiling tiles, wooden fixtures and more. Drywall crumbling, rotting and molding of your joists, ceiling tile swelling, floor tile buckling and peeling paint are among some of the symptoms of extensive water damage. If you're planning on basement remodeling, give us a call today to make sure your basement is as safe, clean and dry as possible before starting.